If you would like to make carbonated drinks but don’t know where to start, you are not alone. Many people want to carbonate soda and other drinks but don’t know what product meets their needs better than the rest. Finding the right carbonation product is important if you would like to enjoy the best possible results. 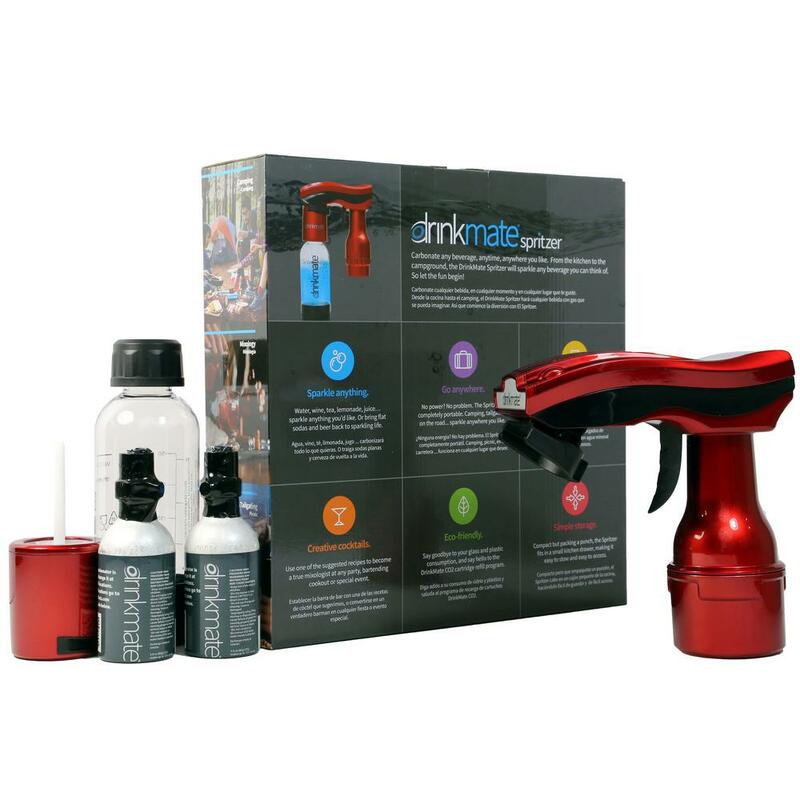 The DrinkMate Spritzer could be the product for which you have been looking, and it offers several advantages you might not find with other items on the market. Learn about the DrinkMate Spritzer and what it can do for you. When people choose the DrinkMate Spritzer, They usually do so because they want a carbonation machine with a small size and easy-to-use design. No matter where you go, you can bring the portable Spritzer along for the ride. You will soon make carbonated drinks at cookouts, picnics, family events and more. Your guests will always look forward to the tasty drinks you bring to the party. When you are ready to head out, the DrinkMate Spritzer can fit in any travel bag or backpack. You never have to worry about hauling bulky equipment from one location to the next. The small and convenient size makes it simple to load and unload the device at any event in which you find yourself. If you enjoy having a great time with friends and family, don’t forget to bring the DrinkMate Spritzer to your next gathering, and you will be glad you did when you take the first sip. If you have never used a carbonation machine, you could be wondering what drinks you should carbonate once you buy it. A lot of people go online and buy soda syrup to make homemade soda for their friends and family, and you can do the same. Most of the syrups you find are generic versions. You can, however, buy bulk supplies of popular soda brands if you want to add an extra touch to the drinks you make. Although you might want to make some of your favorite sodas, you can also use the DrinkMate Spritzer to carbonate a variety of other drinks. Try carbonating your orange juice in the morning to add a unique touch to one of the world’s favorite breakfast drinks. Tea and coffee are other drinks people enjoy carbonating. Rather than using the standard amount of carbonation, try mixing it up to find the right balance for your tastes, and you won’t be disappointed. This section covers how the DrinkMate Spritzer works and how you use it. You start by placing the carbon dioxide cartridge in the unit before use, and you then unscrew the bottle from the device. Pour the drink of your choice into the bottle until you reach the fill line. You will then screw the bottle back into the DrinkMate Spritzer and squeeze the trigger in three-second bursts. Once you have added the carbonation, unscrew the bottle and pour your drink into a cup. You can repeat the process as many times as you need to give everyone the delicious drinks they love. Is the DrinkMate Spritzer Right for You? The DrinkMate Spritzer has many benefits you won’t want to miss, but it’s not for everyone. Ensure that you make the best possible choice for your situation and goals. Although the DrinkMate Spritzer’s size makes it portable enough to take on the go, you will need to replace the carbon dioxide cartridge more often than you would with other models. If you would like to make drinks without interruptions, pick up a few extra cartridges to keep on hand, and you will never run out of tasty drinks to prepare for your events. The design of the Spritzer makes it easy to use and hold, but it can’t stand up on its own. As long as these downsides don’t turn you away from the benefits, this could be the perfect product for you. DrinkMate makes a variety of products that carbonate drinks, and the Spritzer is one of the most portable options. Take it to the park, on road trips or anywhere you decide to travel, and carbonated drinks will only be a few squeezes away. Whether you would like to try carbonated juices, teas or coffees, this product does the job right the first time. Fill up the bottle, put it in the unit and squeeze the trigger for homemade drinks of which anyone would be proud. Testing different amounts of carbonation allows you to create unique drinks you won’t find anywhere else in the world. You can soon have your own collection of carbonated drinks, and making more will never be difficult. As long as you don’t mind the small carbon dioxide cartridges, this product won’t let you down.